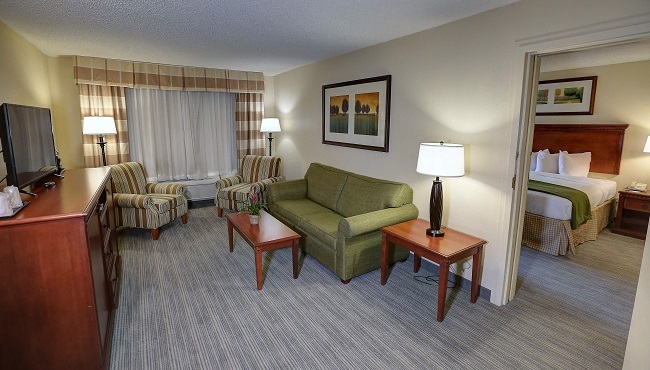 After a full day of visiting local attractions or attending business meetings, find comfort in your hotel room or suite at the Country Inn & Suites, Charlotte I-85 Airport. You can recline on the plush bedding to watch your favorite shows on HBO, read the free weekday USA TODAY® newspaper or check email with free Wi-Fi. If you need an energy boost, brew a hot cup of joe in your room’s coffeemaker. Children 18 and under stay free with an adult, a feature that traveling parents love. Corporate travelers appreciate each room’s spacious work desk with a lamp and data port. Up to five travelers can sleep comfortably in a Standard Double Queen Room, which features two queen beds, plenty of space and all standard amenities. 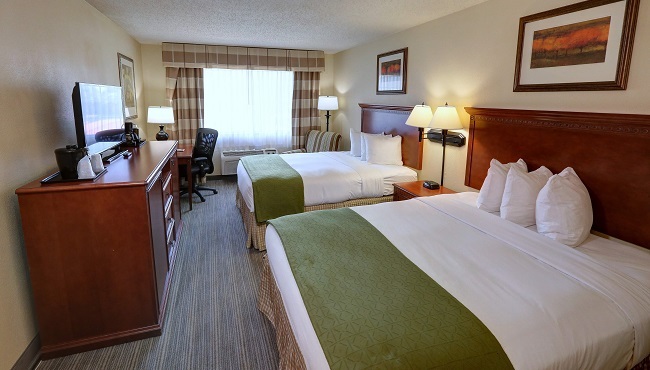 Standard King Rooms provide spacious arrangements for business travelers and families alike, with a plush king bed and all standard amenities, plus a vanity outside the bathroom. Enjoy two queen beds and a flat-screen TV in the bedroom area, as well as a living area with a sleeper sofa and additional TV. This suite includes a vanity outside the bathroom and all standard amenities. Get a wonderful night’s sleep in a King One-bedroom Suite, which comes with a large king bed, a flat-screen TV, a vanity outside the bathroom, and a separate living area with a sleeper sofa and an additional flat-screen TV.